Piper Aircraft, Inc., has asked the FAA to reconsider the process it is undergoing related to the NPRM Airworthiness Directive and change it to an SAIB, and it is asking Piper owners to submit comments by Monday, February 4. Unfortunately, in the investigation of the accident which gives rise to this “Interim” NPRM AD, the FAA has chosen to depart from this long history and instead invoke “ex-parte” rules while initiating a blanket order where the owners of more than 40,000 aircraft bear the burden of removing wing fasteners on perfectly safe aircraft in order to determine whether a fatigue crack found in the accident aircraft (and also found in one other aircraft operated by the same entity) might be present elsewhere. This is all being done before the conclusion of the NTSB investigation designed to determine the cause of the accident. 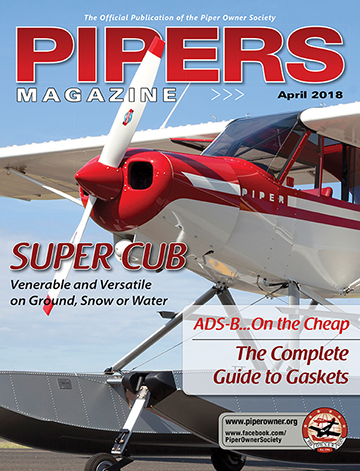 With this in mind, Piper Aircraft, Inc. urges the FAA to remove the veil of ex-parte communication in order that we might again work together along with the NTSB, to complete the open investigation, determine a probable cause, and initiate appropriate safety actions (involving Piper and/or the owner of the accident aircraft). The FAA launched the discussion period and NPRM (Notice of Proposed Rulemaking) AD in late December, and it ends Monday, February 4, as it prepares to issue an AD following the Embry-Riddle crash last year in which a heavily used training plane suffered a catastrophic fatigue crack, resulting in the death of a student and a designated flight examiner. For more information, see our previous stories and visit https://www.regulations.gov/docket?D=FAA-2018-1046. It is inappropriate to utilize an Airworthiness Directive as an investigational tool in order to determine if a yet unknown “unsafe condition” exists. A much more targeted SAIB would be more appropriate for this activity since a blanket AD would likely interfere with the ongoing investigation by the NTSB. The “Interim” NPRM AD inspection action as proposed will unnecessarily increase the likelihood of creating a safety hazard due to unintentional discrete wing spar or spar/fuselage fastener hole damage for the over 40,000 aircraft. This hazard does not currently exist for these products. The selection of an overly broad cross-section of aircraft models spanning all model years for both the PA-28 and PA-32 aircraft as contained in the “Interim” NPRM AD is improper because it is overly comprehensive and unsubstantiated. Many aircraft models that have been included in the FAA’s proposed “unsafe condition” determination have reduced loads, different design requirement considerations and various structural layouts that improve and/or reduce the loading spectrum. This subjects an unnecessary number of aircraft to these invasive inspections. The “Interim” NPRM AD proposes to utilize an inspection criteria related to a factored service life (5,000 hours) that is overly conservative and not supported by industry standard detailed rational engineering analysis for each of the referenced PA-28 and PA- 32 models listed in the publication. Calculation of the factored life does not clearly capture aircraft that do not perform 100 hour inspections but are engaged or have been engaged in the type of activities being investigated. The FAA’s estimation of the financial impact on all operators of the “Interim” NPRM AD proposal vastly understates the cost to the operators, owners and maintenance personnel in several respects which includes the complete omission of the costs related to the NAS 410 Level II/III Technician which is required to perform each such inspection. The tasks required in order to perform the fastener removal for the inspection pose additional unnecessary risks which may create a feature (notch, gouge, thread mark, etc.) that is likely to cause a safety or airworthiness hazard. … Piper Aircraft, Inc. customer service has already received reports of spar fastener holes that were damaged during the removal of the bolts. Additionally, Piper said the NPRM AD greatly underestimated the cost of compliance. Piper Owner Society member Jim Curns agreed, saying that while his plane doesn’t actually need this work because of the formula, he investigated getting the work done anyway, just for peace of mind and under the initial FAA guidance that the work wouldn’t be that expensive. Curns said the FAA is incorrect in its assessment that the typical pilot and their A&P can execute an eddy current NDT (non-destructive test) for a few hundred dollars. That sentiment is part of what concerns Piper. While the calculator indicates that non-training planes won’t need this work, that assumes that the owner can document its entire history. Secondly, even if documentation is possible, plane owners like Curns are now at least mildly concerned about something that Piper says is not backed by data. Returning to the letter. Piper Aircraft Inc. contends that, similar to the original AD 87-08-08 which was ultimately rescinded by the FAA, the inspections proposed by this “Interim” NPRM AD will again show that no cracks will be found in the subject areas based on analysis and test data and potentially introduce an “unsafe condition.” As such, this NPRM AD activity is not warranted due to the misuse of the regulatory approach, deficiencies of the proposals technical merit, excessive economic impact factors and overly broad expanse of aircraft currently proposed. Piper Aircraft Inc. recommends the following: The FAA should remove the ex-parte rule and resume normal communication in order to collaborate on a combined solution while working with the NTSB and Piper Aircraft, Inc.
Members can download a PDF of the letter below.